Torden | Thunderstorm – Just another . . . . . . . . . blog! 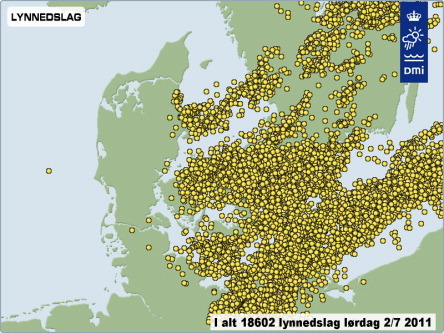 Denmark received MANY lightnings the other day. Here is a graphical presentation of the 18602 flashes. You cannot imagine how long I spent studying this photo the other day. Sometimes I think too much. Sometimes a thunderstorm is just a thunderstorm! Of course, that was one fierce thunderstorm. No I can not. But I can explain a little about the photo. It is shot from The Cemetery island ‘Michele’ near the main isles of Venice. 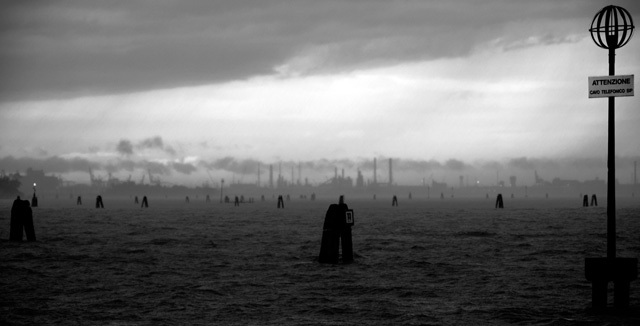 The horizon with chimneys and large structures is some heavy industry on the main land. The only link to the following illustration is the thunderstorm. – Which was more or less history when the photo was taken. The reason I posted this image is that it was approved for “The National” – an annual photo exhibition in Denmark. Later the lightning overview was added – beacuse of the title. It’s always interesting to know the story behind the story. Shall I tell you what I thought about? I shall. Wait, wait — first, congratulations! My first impression was of utter desolation: an industrial skyline clouded in smoke and haze, viewed across a sullen, choppy sea. I spent a long time trying to decide whether the viewer was sailing away thinking “Good-bye and good riddance” or moving toward that dismal shore filled with dread. But the sign commanded me to pay attention–there was something about telephones that I couldn’t read–I gave passing thought to why a Danish sign would be written in Italian–and suddenly all I could see was a graveyard for cellphones, flipped partway open, their antennas aimed uselessly at the leaden sky. It was at that point that I decided I needed to go for a nice long walk with the dogs. The addition of the map persuaded me I was being utterly fanciful. But once you told me about the Venetian cemetery island I went off to study the matter some more. Now I feel a tiny bit vindicated. A prison island turned into a cemetery by occupying forces must be filled with echoes and fever dreams, although perhaps not cellphones. Those are most likely a representation of the Evil Empire of Murdoch looming over us all. Hope you had a good long walk. -With the dogs! I’m sure it is safe with canine company when wandering around between trees at dusk or darker. -With your imagination. Congratulations, Carsten, on getting this wonderful photo accepted. Sounds like a very prestigious exhibition. I’ll have to be satisfied getting photos accepted. And really I am! The way to the prizes are through hard work and lots of mistakes. The mood in your fine photo is very special – great shot – I’m glad it was choosen for the exhibition, congatulations!!! I have spent some (wet!) days along the West-Coast of Jutland – where we had no lightnings!!! I’m looking forward to spending sunny days near KlitmÃ¸ller. This is a very unusual and interesting view of a part of Venice. One I am glad you explained. My first impression when I looked at your picture was that it could be a landscape I imagined in C. McCarthy’s book “The Road”. I was like Gerry, thinking too much about it and letting my imagination go wild 😉 If I had read the sign in Italian my thoughts would have taken a completely different turn. In any case this is a fabulous image and I am really happy it was approved in your “National” exhibition in Denmark. Congratulations Carsten ! Thank you very much Isabelle. It is so good reading about the different thoughts the pictures bring about. -Thoughts and views I could never find alone because my imagination is blocked by the facts I know about the images.